WINONA LAKE – The weather outside was frightful. And the basketball inside saw Taylor University leave Grace feeling cold in the women’s and men’s doubleheader at the Manahan Orthopaedic Capital Center. Grace’s men’s basketball team was unable to recover from a sluggish start on Saturday, losing 81-74 to Taylor. Grace had four players score in double figures, but the Lancers shot just 41 percent as a team compared to 52 percent for the Trojans (11-11, 5-5 Crossroads League). Charlie Warner led the Lancers (11-11, 1-9 CL) by scoring 18 points. Logan Godfrey added 16 points, 7 rebounds and 2 assists. The chilly temperatures outside carried over to Grace’s shooting to start Saturday’s game. The Lancers scored just two points for the first five minutes of play, and Taylor jumped ahead 13-2. Grace managed to battle back. Warner scored six points, and Deaton added four more to trim the deficit to 21-16. But the Trojans sped away to close the half. Taylor opened up a 39-28 lead by halftime. Taylor shot 55 percent in the first half. The Lancers struggled to shoot 36 percent in the first half and missed all seven of their 3-pointers. Grace also tallied just two assists. Taylor’s momentum carried over to the start of the second half. The Trojans opened up an 18-point lead with 17 minutes to play, marking the largest lead of the contest. But Grace maintained its focus and patiently chipped away at Taylor’s lead. Back-to-back 3-pointers from Eddie Gill IV and Deaton helped spark Grace’s surge. Gill and Martin Schiele then used defense to create offense a few minutes later. Schiele stole the ball off Taylor’s point guard and converted a layup while being fouled. On the next play, Gill mimicked Schiele. He stole a pass and threw down a fastbreak dunk. On Grace’s next play, Schiele buried a triple from the top of the key which sliced Taylor’s lead down to 65-60 with 6:32 on the clock. Three minutes later, Schiele drilled another 3-pointer to make the score 71-67 with 3:29 remaining. With a minute left, Grace still trailed by four. The Lancers got the defensive stop they wanted, but Taylor scrapped its way to an offensive rebound. Grace was forced to foul to extend the game. The Trojans could not miss from the foul line, however, going 8-for-8 on free throws in the last minute to secure the road win. For the game, Grace outrebounded Taylor by five thanks to 13 offensive rebounds. But Taylor’s strong shooting from the floor (52 percent) and the foul line (86 percent) was too great to overcome. Deaton scored 14 points with eight rebounds off the bench, and Schiele had 11 points and two assists. Jaret Sons tallied eight points and five boards, and Gill tallied seven points and five rebounds. The Lancers will next travel to league leader Spring Arbor on Tuesday for a 7 p.m. clash. With 1.3 seconds remaining on Saturday, Grace’s women’s basketball team thought it had locked up an upset of No. 11 Taylor. But the Trojans had the final shot, and they made it count. Becca Buchs threw up a leaning prayer off the inbounds play, and her miraculous shot went in to seal Taylor’s 69-68 win. Brooke Treadway had given Grace the lead on the previous play. After Vironnica Drake’s driving shot misfired, Treadway grabbed the board and finished her layup in traffic for a 68-67 lead with 1.3 seconds left. The Lady Lancers (10-12, 4-6 Crossroads League) nearly won despite its top two scorers combining to shoot 7-of-24. Drake and Brooke Sugg, who average 33.2 combined points per game, were held to nine points apiece. Lauren Godfrey picked up the scoring slack, producing a career-high 18 points on 7-of-13 shooting and 4-of-8 on 3-pointers. Kamryn Hostetler also scored 14 points with a trio of 3-pointers. The first half was classic back-and-forth Crossroads League action. Grace could not have started the game worse, but the team quickly recovered. The Lady Lancers came up empty on their first nine possessions. Grace fell behind 9-0 and did not score for the first 5:02 of the game. When Grace finally did score, the points came in bunches. Kaylie Warble and Hostetler made and-1s on back-to-back plays, and Brielle Wilson hit a 3-pointer soon after. Taylor’s lead was chopped down to 17-13 by the end of the opening period. Grace went on a 7-0 run early in the second quarter, and a triple from Godfrey tied the score 20-20. After a turnover, Pam Miller scored for Grace’s first lead at 22-21. The Trojans (17-4, 8-2 CL) responded aptly, using a 13-2 run to open up a 33-24 cushion. But Grace battled right back. Vironnica Drake scored five points late in the quarter, and the Lady Lancers trailed just 36-34 at halftime. Taylor was forced into 13 turnovers in the first half but owned a plus-seven advantage in rebounds. The Trojans also hit eight triples in the half compared to three for Grace. The game swung Taylor’s way early in the third quarter with a pair of 5-0 runs, and Grace found itself behind 49-40. But Grace’s defense locked down Taylor, and Godfrey sparked a comeback. Taylor was held to just two points over the final six minutes of the quarter, and Godfrey hit back-to-back triples. Her last 3-pointer tied the score 51-51 as the teams entered the last stanza. 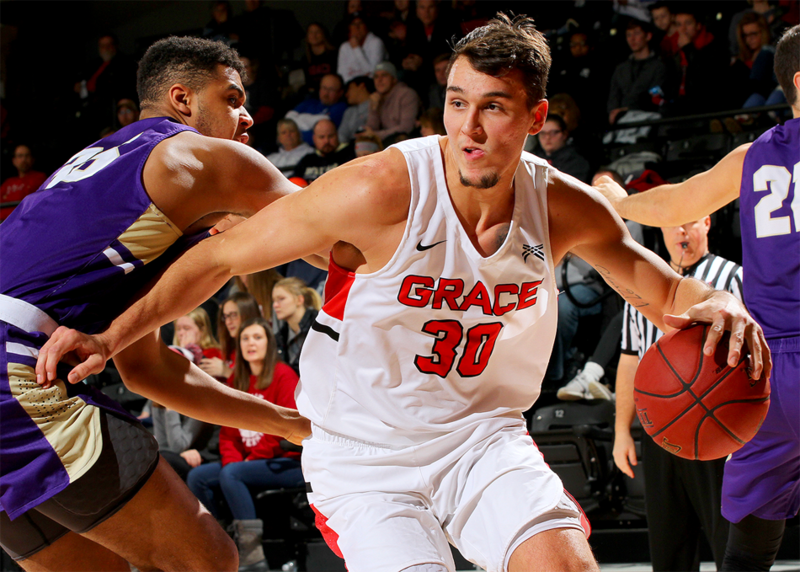 The sides exchanged small runs to start the fourth quarter, and Grace pulled ahead 59-56 with an 8-0 run. Godfrey and Sugg each hit a 3-pointer, and Pam Miller also scored during the run. But the Trojans responded and opened up a three-point lead with two minutes remaining. Drake made a pull-up jumper with 1:36 on the clock to cut Taylor’s lead to one, but both teams misfired on the next possession. Taylor had a chance to hold the ball after Grace missed a 3-pointer, but good defensive pressure from Drake forced a turnover to give the Lady Lancers a chance. Grace made good on its chance thanks to Treadway’s clutch layup, but 1.3 seconds proved to be all Taylor needed to win the game. Both teams shot 44 percent from the floor, but the Lady Lancers only took four free throws. Grace did have 18 assists, its second-most in league play, to go along with 12 steals. Godfrey had 18 points, 3 assists and 3 boards, and Hostetler had 14 points, 3 assists, 3 boards and 2 steals. Sugg tallied nine points with five assists, and Drake added 9 points, 7 rebounds and 3 steals. Treadway had 6 points, 5 rebounds and 2 assists, Miller made both of her shots for four points, and Wilson added three points and three steals. The Lady Lancers are on the road next week for their longest two trips of the Crossroads League season. Grace plays at Spring Arbor on Wednesday and at Mt. Vernon Nazarene on Saturday.